Blue Skies Over Bromo | What an Amazing World! In a cold dawn at Cemoro Lawang, James and I are awaken by the loud alarm from my phone and smell the putrid odor of sulphur inside the room. The night wind must have blown away the puffs from Mount Bromo’s crater to the village a few hours earlier. One minute later a man knocks on the door – a cue for us to get ready for the early dawn hike to Mount Penanjakan in the cold but refreshing air more than 2,000 m above sea level. 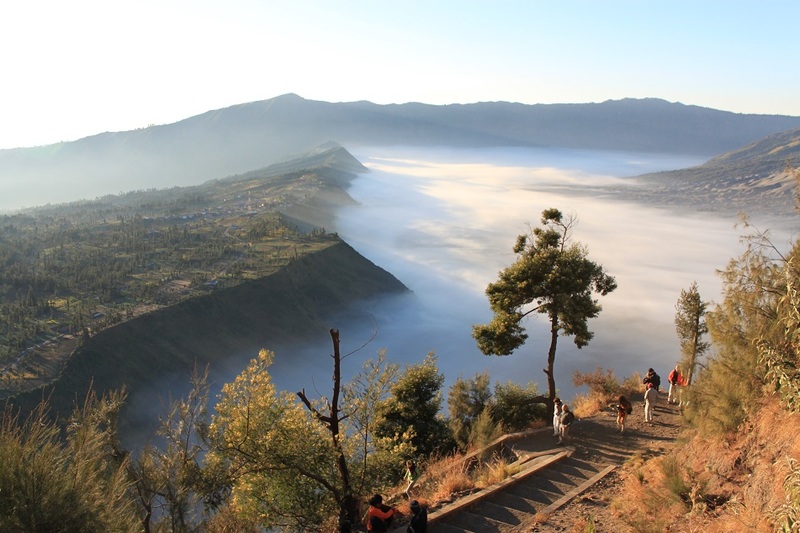 Mount Penanjakan has always been the main choice for viewing the fabled sunrise when the warm golden light would fall onto Tengger Caldera where the restless Mount Bromo and the long-extinct volcano – Mount Batok – reside on its bed. We walk to the front yard of our hotel and find a handful of Jeeps waiting for the guests. We spot ours – a green and sturdy old Jeep – and hop onto it right away. A short bumpy ride takes us to the base of the hiking trail to the viewpoint which is only passable on foot or by horse. With two flashlights in hand, we hike the treacherous trail which feels like covered in powdery thick ash to get to the viewpoint before the sun streaks its first light. We feel the thin air makes the hike challenging, but fortunately the sun has yet to rise when we arrive. Being among the first to reach the viewpoint, we manage to secure a nice spot – on the edge of the caldera’s wall where a rock perched on the ground on which we put our cameras and get a good grip to keep ourselves firmed onto our positions. While the sun is still hidden behind the horizon, the full moon and stars brighten up the cloudless dark sky, and eventually hide themselves as morning comes. At 5 am, the sun begins to cast orange hue to the wall of the caldera, dramatically changes the majestic landscape into bursts of vivid colors. 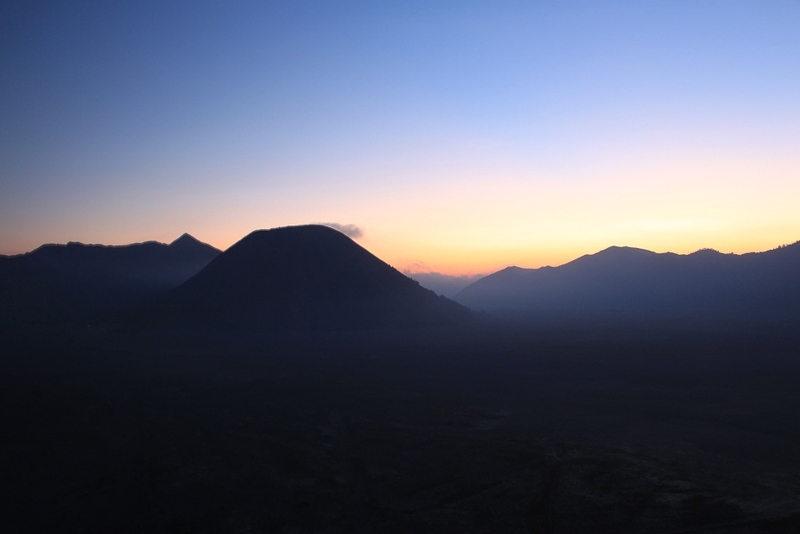 At the background, Semeru – Java’s highest point – peeks out of the dark, followed by Bromo and Batok a short moment later. 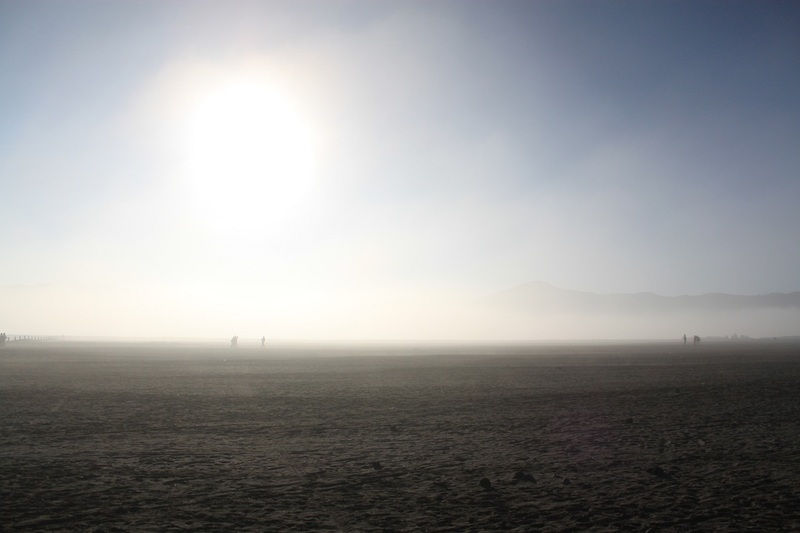 The morning mist still lingers on the bottom of the caldera, blanketing the Sea of Sand beneath. Even though this is not my first time, this legendary sunrise over the enthralling landscape never ceases to fail me. This time it is actually even better. “This is one the most beautiful sunrises I have ever seen,” James says. Amidst the amazement and amusement of the visitors, vendors offer various kinds of hot drinks one might need to keep the body warm in the chilly mountain air. However, that is not the thing which catches my attention. “Masker, masker,” some of the vendors are trying to sell simple facemasks along with hot drinks and simple snacks. I approach one of them and ask her if it is so dusty down there in the caldera. “Ya,” she answers while nodding. I buy two, just for preparation in case we would need them. We do not have to wait that long to find out. On our way down to the hiking base, the sun has completely risen and we can see our path clearly – it is indeed covered in thick ash. Every single step, or horse step, causes minor clouds of dust over the path. Apparently, we do not need to wait until we get to the Sea of Sand to wear our masks. 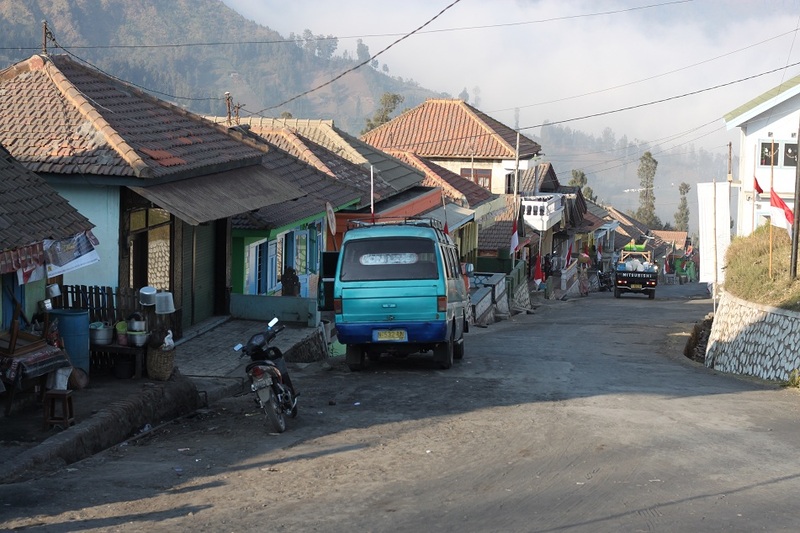 On our way down to the Sea of Sand at the bed of the ancient caldera, we pass through Cemoro Lawang – a very small village where we spent the previous night at one of the more decent hotels. The village does not change much from my last visit. But this time the sky is such a delight – blue and clear with no overcasting clouds. 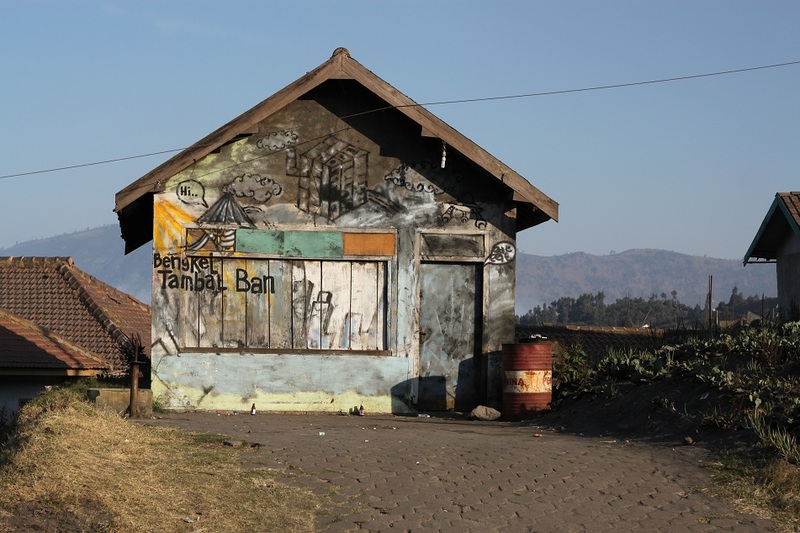 One day earlier, we reached this village which is the primary choice for visitors to Bromo to stay due to its proximity to the caldera. In fact, it is located on one edge of the caldera. Before sunset, we set our tripods at one corner of the village, bordering the steep slope of the deep caldera. 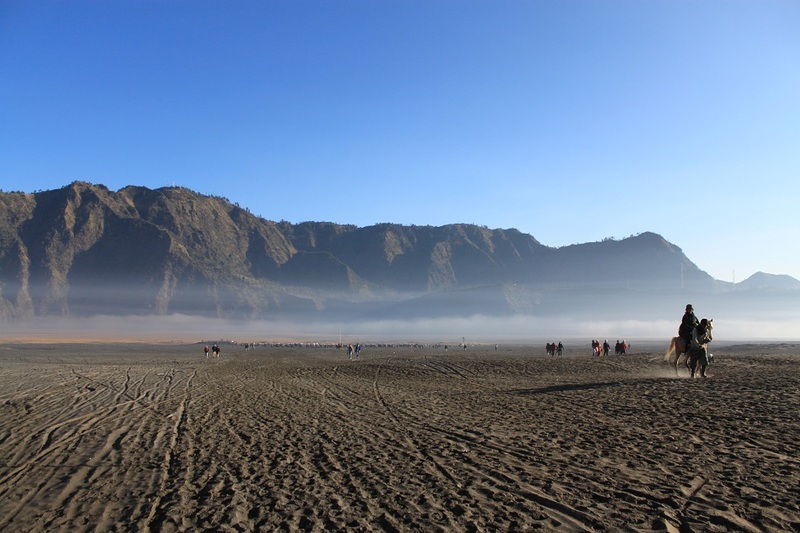 The silhouette of Mount Batok, Bromo and the rugged terrain surrounding the two mountains were just too good to miss. However, it was the creeping thick mist which forced us to pack our tripods and go back to the hotel for seeking refuge from the coldness. A few steps away, there is a restaurant where I had my dinner last November. Unfortunately when we found it, it was already dark, devoid of any sound or activity. Then we walked to our hotel, in search for another local restaurant where food usually tastes much more authentic. We spotted an open restaurant and peeked inside. There was nobody in there. Hesitantly I went inside and looked into the living room behind the dining area and found a family watching TV. I asked them whether they still serve food for dinner and gladly a grandmother who was sitting in the kitchen said yes. I ordered two bowls of soto ayam (chicken soup with a generous scoop of white rice, tinted with the yellowish color from turmeric) which came with a very spicy but addictive sambal (stir-fried ground red chili) and sweet hot tea. To my surprise, it actually tasted a lot better than my previous soto ayam in Cemoro Lawang. Such a simple yet perfect dinner to warm up our bodies against the cold air, indeed. With the wall of the caldera to the left and the the Sea of Sand to the right, the Jeep takes us down the slope through a narrow road which opens up to the vast expanse of the desert-like caldera bed. 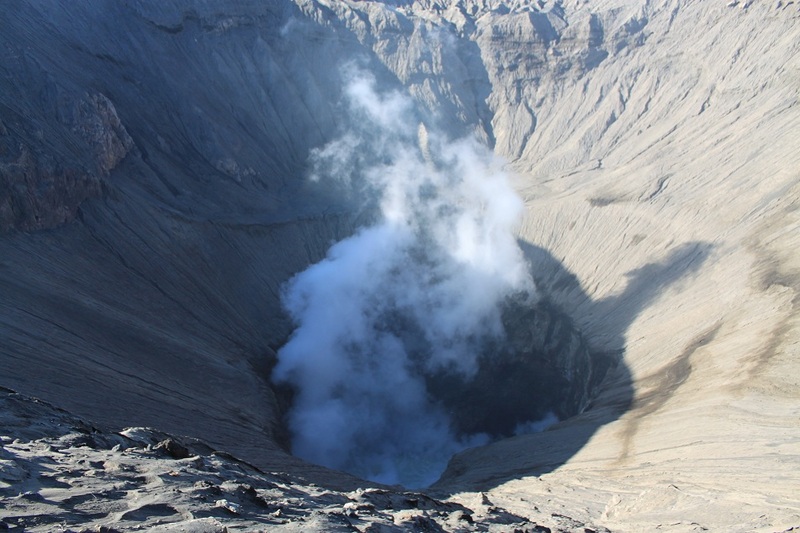 January 2011 was the last time Mount Bromo erupted, leaving thick layers of ash on its surroundings. The Jeep rushes us to the base of the hike to Mount Bromo, cutting through ethereal morning mist which together with the majestic backdrop bring surreal atmosphere to this place. The Jeeps parks just outside a row of ash-covered fence, lining up with other colorful 4WDs. The view is as breathtaking as ever and it makes me relive my memories of the amazement I felt for standing right on the bed of this ancient giant caldera for the first time. We walk toward the hiking trail, following the very same trail I took eleven months earlier. Reaching the summit, we stand on the rim of the seemingly docile crater, puffing clouds of sulphureous gas every now and then. However, the water level of the crater has increased significantly than what I remember from my previous visit, implying an increasing activity of this volcano. Nevertheless, I feel strangely peaceful up here. Satisfied with what we just saw, we head back to the village which is currently adorned with janur (Indonesian Hindu decoration made from palm leaves). 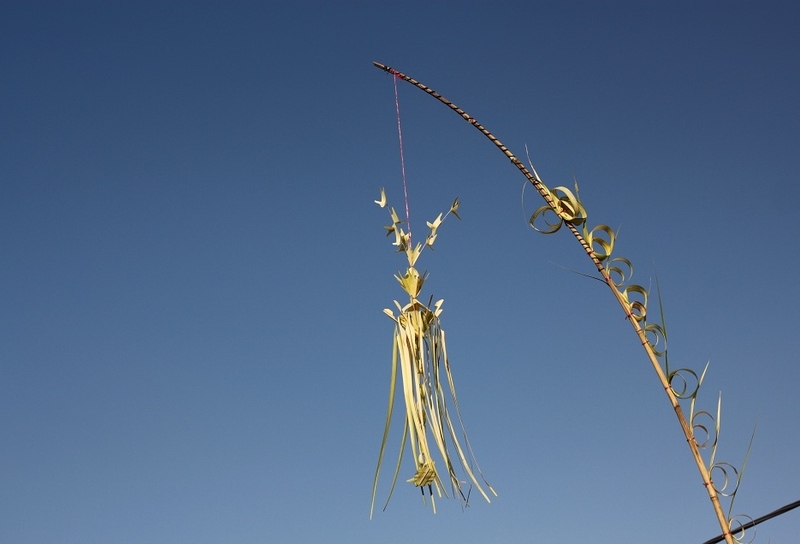 The local people – the Tenggerese – have just observed the Karo several days earlier, celebrating the creation of the universe. Despite some differences in Hinduism practices, all the janur really remind me of similar Balinese traditional decoration which is also still used by most Javanese on wedding ceremonies. 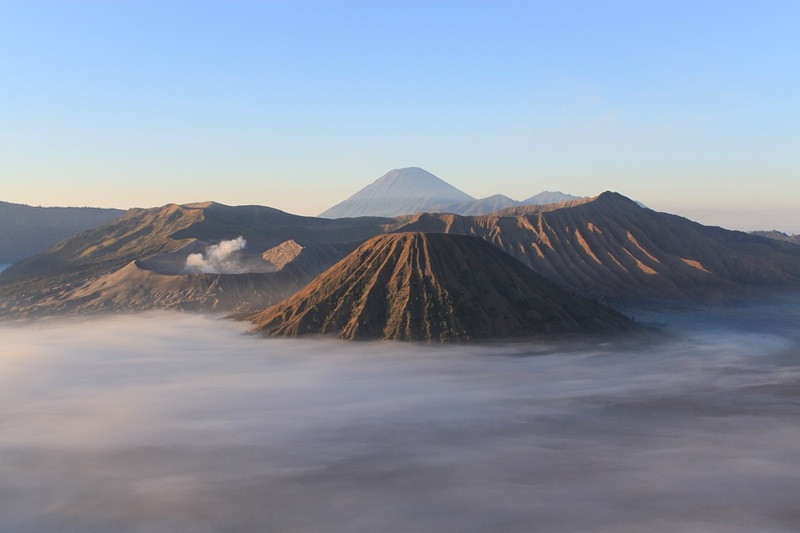 Mount Bromo is not the most active volcano in Indonesia, nor it is the tallest. But it is easy to comprehend why this volcano draws so many visitors every year. Its sublime backdrop will always amaze even the most experienced mountaineers and well-seasoned travelers. At 11.45 we jump on our car which takes us to Surabaya, leaving the great landscape behind. But this short trip only makes us even more curious to further explore the breadth of this beautiful archipelago. Those are truly amazing photos. Much respect. Gives me a reason to see indonesia. Thanks Atticus! Even for me who lives in the country, there are still so many corners of Indonesia that I haven’t visited yet. No, I didn’t. In fact I took it off the whole day because everything just looked perfect. Wow! That’s an awesome story to go along with some awe-inspiring shots! Thanks Jack! It’s almost impossible to not be inspired by this place. It’s really worth a visit when you travel to Indonesia. Thanks Nirav! Everyone would be amazed by the beautiful landscape. Beautiful, beautiful shots Bama! 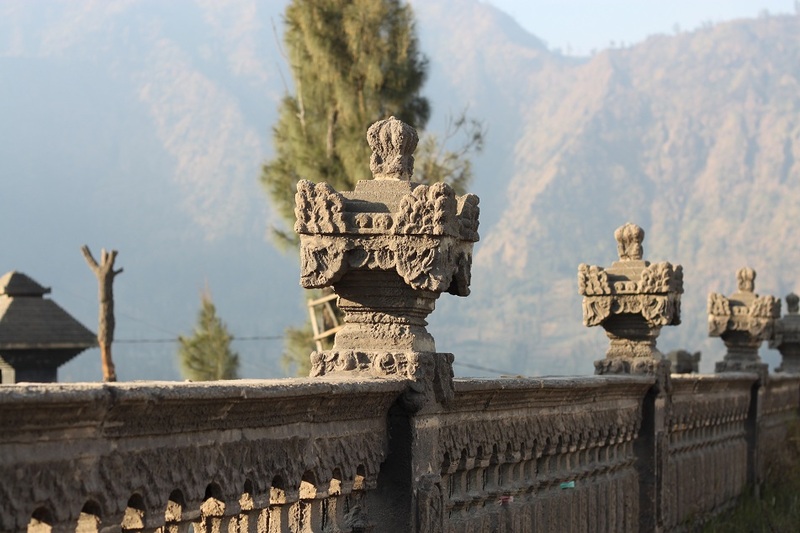 I still can’t believe I didn’t take one of the janur – considering how they were everywhere in Cemoro Lawang. I’ll have to learn from your observant eye! A spectacular looking place. Great photos! Thanks Deano! I’m sure you would love to be at this place. Actually doesnt look like anyplace I would expect to be in Indonesia! For sure! Actually looks like somewhere Mongolia – great stuff! Amazing place and photographs.. I want go there..
It’s been great seeing two lots of photos of Mt Bromo. I’ve really enjoyed the memories they have brought back. I’m really glad all of them have brought back some good memories to you. Wow — your photos are stunning this time (well, they always are, but these are patricularly beautiful). This is one of my favorite posts of yours, and after reading through it, I know I definitely need to come to Indonesia on my travels. Thanks Andrew! I was lucky the sky befriended me that day. When you do come, make sure to visit this place not on the weekend. These photos are staggeringly beautiful, Bama. I can’t stop looking at them… and wishing for a trip to Indonesia! Thanks, Meghan! This place is quintessentially Indonesian as it is a country where volcanoes are part of daily life. So when you do come to Indonesia, make sure you don’t miss it! wow, this is breathtaking shots!!! i have never realized before that indo can be this beautiful! Thanks Fiona! In the future, I will do more trips around Indonesia and share the stories and photographs here. It is! And the landscape is so iconic to describe Indonesia as volcanoes are part of daily life for most people. Thanks Ritu! Is that also a picture of Bromo and Semeru on your blog’s header? Loved that place! looks like moonscape, and it’s so gorgeous at dawn! I don’t know how to describe the beauty of this place. In a way it looks indeed like heaven. Thanks a lot Madhu! Well, blogging actually taught me to take better pictures. There are tons of great and inspiring photographs in the bloggosphere! That is such a nice compliment! Thanks for dropping by! How beautiful! This really inspires me to visit Bromo now! Oh dear. I don’t need to be inspired to travel MORE. Haha! This could prove disastrous… 😛 Definitely can’t wait to be more inspired sometime in the new future though 😛 Thanks for the post! I have gone to Bromo twice. The first time was in November 2011 and the second time was a few weeks ago. Last year I used this link from Wikitravel to reach Cemoro Lawang from Surabaya by public transport: http://wikitravel.org/en/Bromo and it worked really well. I stayed in a homestay but I don’t really recommend it unless you can shower with freezing water and sleep in dreary room. But on my second visit, I chose a more comfortable way. 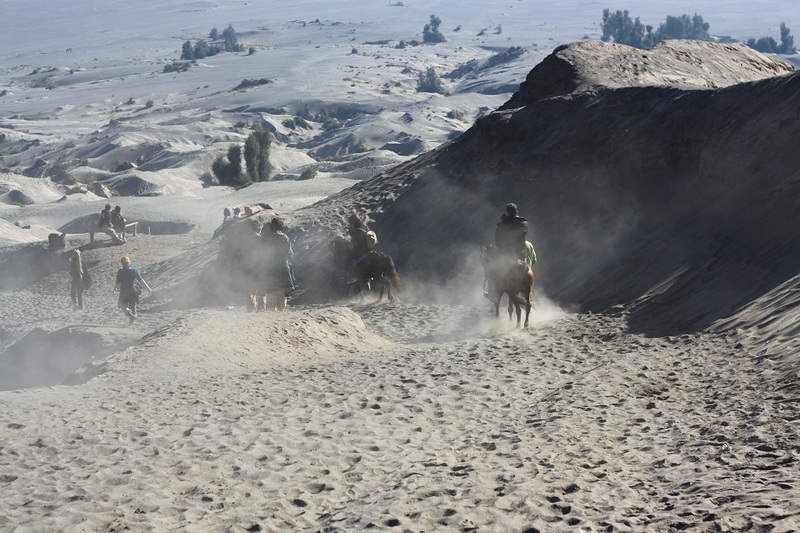 I stayed in a hotel called “Bromo Permai 1” and it was one of the best choices around. They have no website but you can make reservation by phone: +6282141581111. They also provide an airport pickup service (which I used) for IDR 600,000 one way. Overall I was quite satisfied with their service. The only drawback was the hot water for shower (when they say they have hot water, they really mean it!). I hope that helps. Have a great stay in Bromo! Thanks a lot! Very useful info.. I’ll try to contact them. Beautiful photos! Went there once when I was younger. Great memory. Thanks Jeannie! I’m glad those pictures brought back great memory to you. Thanks Lu! Your comment made my day! 🙂 Knowing how much you love geology and such thing, I believe you’ll love Mount Bromo. One day you will visit Indonesia, Lu! Amazing, amazing post. The photos are breathtaking! Thanks for your kind words Sindhu! 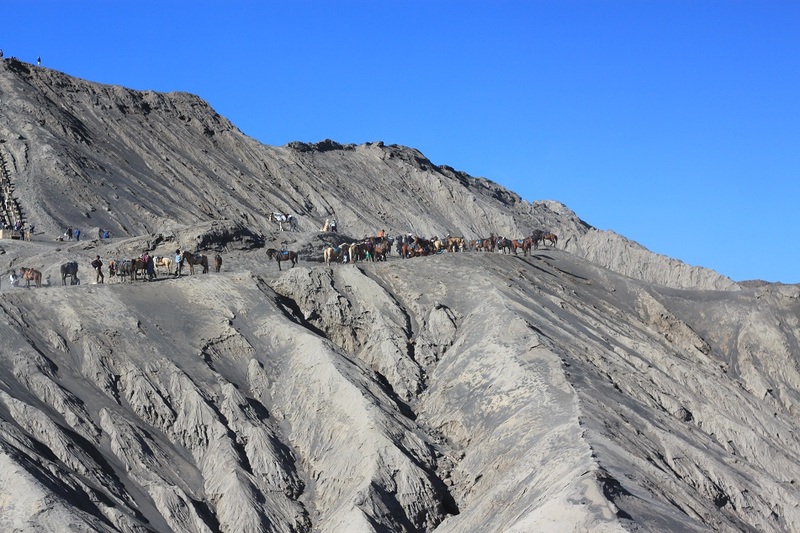 Bromo is always beautiful, whenever you visit it. I fully agree with you. I went there twice – in rainy and dry season – and it was so beautiful no matter the season. Bromi is tranquille and mistique place, i feel a different insight every time i visit it. It is indeed a special place. I know someone who has visited Bromo in different times of the year and he said every visit has its own uniqueness. Thanks Rio! I am planning to be in Indonesia in November and December. Is that a good time to visit the volcano? Enjoy your time in Indonesia! Drop me a message if you need any further information. This blog post makes me want to visit Indonesia (now!) 🙂 Great Photos. Hi James! Thanks for dropping by! Indonesia and the Philippines have so many things in common. But you’re right, Bromo is definitely worth a visit. I went there twice and both trips were amazing! I noticed that you’ve been to Manila already – although just for a very short time. You’re right, lots of similarities. Even down to how we look.haha. Will drop by from time to time. Yes I have, but only for a short weekend jaunt. I really would love to come back to the Philippines one day and explore more of the provinces. Beautiful pictures! I’m so happy I found your blog… I love gorgeous photography that makes you want to book a plane ticket and plan a new trip. thanks! Thanks Daryl and Alana! I guess we travel bloggers inspire each other with our photos and stories. Every blog post tickle that wanderlust within ourselves. 🙂 Happy travels! Insane photos! You need to start a South American section next. Here is my story and photos of Ecuador. Enjoy. Thanks Erin! I’ve been dreaming to go to South America and currently I’m saving up really hard to make that and other trips happen. 🙂 Thanks for dropping by! been there last month..ah i truly love this mount 😉 Nice pictures anyway brother! Thanks Muthia! I would definitely go back to Bromo one day. It’s one of those places that you’ll never get bored of. you. what nationality are you? lets having trip together someday! and take another great pictures , let the world surprised us . Oh why there is no photos for the sun rise? “The Small Workshop” picture is simply beautiful. The earthy colours, blanketed by the morning sunshine. ‘Keren mase’!! Thanks Bapake. It’s only a month away to another trip with you and the rest of the team. After listening to your story about the waterfalls I really want to check that place and feel the mysterious ambiance. Let’s do the research about MOKSA. Also about the Gajah Mada, Majapahit and Hindhu Tengger. So eccited. I found out about moksa when I was in the 6th grade back in 1996. I read the story of Ramayana and found the word repeatedly mentioned in the story book. Yet I still have so many things to learn and explore prior to the trip to Bromo next month. Can’t wait for that! This is really tempting me! Have you been to Lake Ijen? Pingback: A Day Without Temples in Jogja | What an Amazing World! been there too … lovely place, worth to visit. Merci! I think I will never get bored of Bromo no matter how often I visit. A truly phenomenal recollection of what there is to see and do in this very amazing part of Indonesia! The photos on this blog post simply have to been seen to be believed, it’s a really special place. great posts about bromo and amazing pictures. I’m planning to go there soon but I’m not sure if I should book one of those tours that pick you up at Yogya for example and arrange accommodation and pick up for the hike or if I should just organize it by myself? how did you do it and which option would you recommend? Thank you again! Those tours from Jogja (and also Bali) are popular among foreigners as they provide relative comfort compared to organizing the trip to Bromo yourself. But I, like other Indonesians, organized the trip myself. 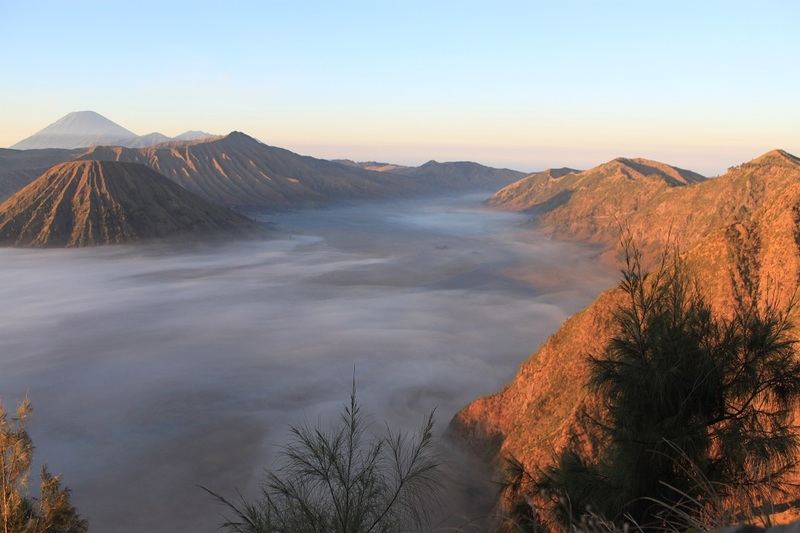 Bromo is conveniently located quite close to two of East Java’s major cities: Surabaya and Malang. So any independent travels should be able to be organized easily. 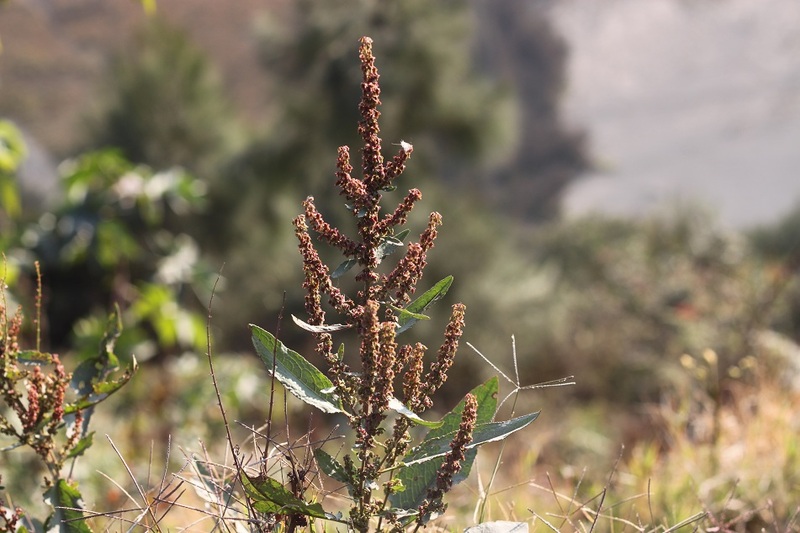 Pingback: Fragrant Water and Putrid Air | What an Amazing World! What an adventure, Bama! I remember reading about Bromo in Nat Geo Mag some years ago. It was a fascinating account because it read something about Indonesians believing that the volcano’s opening is a portal to a subterranean world. I love stores like these and especially adventures that challenge you and take your breath away. Thanks for sharing! It was fun! I can’t believe this was six years ago! The local people who are predominantly Hindu, as opposed to the majority Muslim population of Java, hold an annual sacrificial ceremony at the volcano’s crater which is related to its creation myth. I’ve been to Bromo three times, but never during the festival. Thanks for reading, Jess!